The fire is moving east toward homes. 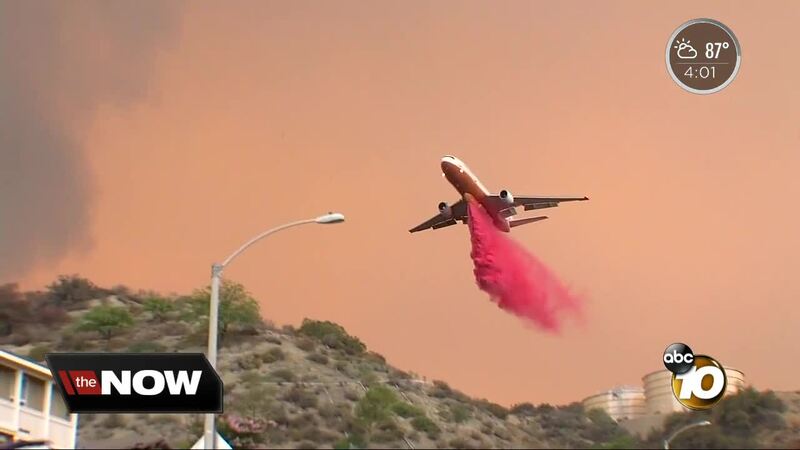 (KGTV) - The fast-moving Holy Fire is ripping its way through the Cleveland National Forest for a third straight day, taking down thousands of acres as high temperatures and low humidity plague the region. U.S. Forest Service officials said the Holy Fire, which erupted Monday afternoon near Holy Jim Canyon and Trabuco Creek roads in the Orange County area, has burned at least 6,200 acres and is 5 percent contained as of Wednesday afternoon. Officials said 383 firefighting personnel are assigned to battle the wildfire. Ten helicopters and seven fixed-wing aircraft are working to support ground personnel. Authorities say 51-year-old Forrest Gordon Clark was arrested on suspicion of felony arson and other charges related to the Holy Fire investigation. Read more. No major injuries have been reported, and at least one structure was destroyed in the blaze. U.S Forest Service officials said an Excessive Heat Warning was issued for the fire area. Weather conditions with temperatures exceeding 100 degrees and relative humidity below 15 percent will provide conditions conducive to extreme fire behavior as well as heat illnesses for the firefighters, officials added. Blue Jay and El Cariso campgrounds. All campgrounds in the Trabuco Ranger District were closed and forest road closures were in effect for Trabuco Creek, Maple Springs, North Main Divide, Bedford and Indian Truck Trail. The communities of McVickers, Rice Canyon, Horsethief, Glen Eden, El Cariso Village, Sycamore Creek, Painted Canyon, and Rancho Capistrano have also been issue mandatory evacuations. Ortega Highway corridor from Lookout Restaurant to Nichols Institute. Lake Elsinore is not under an evacuation warning, the U.S. Forest Service said. Small Animals can be evacuated to Animal Friends of the Valley at 33751 Mission Trail in Wildomar. Information was available by calling (951) 674-0618 between 8 a.m. and 4 p.m. or (951) 506-5069 between 4 p.m. and 8 a.m. The fire was burning downhill toward the Main Divide forest road at a "moderate rate of speed," within sight of Corona, El Cerrito and Glen Ivy Hot Springs, according to the U.S. Forest Service. Ferocious "firenado" seen swirling amid the so-called Holy Fire, which has scorched thousands of acres in Southern California's Cleveland National Forest.